Keranique and Rogaine are two of the big hitters in the hair loss market. If you’re experiencing hair loss and have been researching it, then you’ve undoubtedly come across these two names. But how do they really compare to each other – is one significantly better than the other, or are they relatively similar? 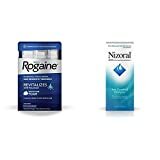 Simply put, these products are extremely similar in the way that they both use minoxidil as their primary hair loss ingredient – though Rogaine has a higher concentration of the hair loss drug. As you might expect, normal Rogaine has 50mg of minoxidil for every gram of product (you might have guessed that from the 5% name). You can also find 2% Rogaine, but this is considered to be less effective and more appropriate for women and people with sensitive scalps. The amount if minoxidil in Keranique is significantly less than this, though Keranique do not state the amount of minoxidil that you’ll find in their products. Like many other minoxidil shampoos, the amount of actually effective hair loss product in their shampoo is questionable. Fortunately, it is relatively easy to apply each of these products to your scalp. Depending on the minoxidil that you buy – foam or regular – you’ll either have to squirt a few drops of product onto your scalp, or rub a small amount of foam onto your scalp (I prefer the foam myself). With Keranique, you’ll get 4 different products to use for your hair. You’ll get shampoos and conditioners to use, and you’ll also get an ‘after the shower’ spray that they recommend you spray onto your hair post shower. You’ll also get another spray to use later in the evening. For this reason, it’s pretty easy to see that Rogaine wins on an ‘ease of use’ scale – it’s considerably easier to use than Keranique. Though the side effects of both of these products is relatively minimal, you will find that you may experience some adverse feeling when using these products. With Rogaine, you are more likely to experience headaches. This is because the high concentration of the drug promotes blood circulation in your head, which in turn has been said to increase the likelihood of headaches. Some people that have used Rogaine have also reported experiencing an itchy, flaking scalp. This is a common side effect of a lot of hair loss products, as some people just don’t work with certain formulas. Another particularly concerning side effect that some people have experienced from using Rogaine is weight gain, though the people experiencing weight gain seems to be minimal. As keranique contains minoxidil as Rogaine does, you’re exposed to all of the same side effects as you would be using either product. It’s worth mentioning a few other side effects that you might experience from either of these products. Another side effect that many people experience from minoxidil is chest pains and an increasing heart rate. Though much of the research behind this is still unknown, it’s though that this is related to the increase of blood circulation throughout the body. There is also the possibility of other symptoms related to anxiety – some people have reported feeling dizzy and lightheaded after starting to use Keranique and Rogaine. It is difficult to tell whether these are symptoms related to the product itself or another issue. If you are considering using either of these two products, then I advise you do a little more research into which one would work best for me. Personally, I would prefer to use the high concentrated Rogaine as opposed to Keranique – it has a better track record and a longer life span within the hair loss industry. The Rogaine name speaks for itself, which is why it’s still extremely popular today.